No matter how full you may feel at first after a meal, there's ALWAYS room for an exceptional dessert - great soup, ice cream, and cake!! Your new portfolio is breathtaking! Love the look and feel. If the man in orange is Bill then his nickname is well deserved...I think he would give George Clooney a run for his money! The dessert soup sounds marvelous and perfect for August. I think I'd rather be "there" too. It's not that I don't love summer (NY is not quite as humid as SC, but it can be pretty bad), but I would still love to be in such a gorgeous place! Bill is a lucky guy to get such a beautifully-presented spread. The soup is very creative and I feel refreshed just looking at it. I love pound cake and the idea of adding fresh blueberries makes me very happy. The ice cream is incredibly creative as well. I'd definitely make room for this dessert. I love the idea of treating the pound cake almost like a cracker, with those thin slices. omg, I get to be the 2nd commenter? I can't figure out how you do such awesome photos. I tried following your one post about white paper/fabric. But my fabric tends to get wrinkly and the paper gets dirty. Can I not achieve the same awesome photos w/just a point/shoot Cannon? mmmmm, so summery! It's recipes like this one, that make me stave off my constant yearn for autumn! 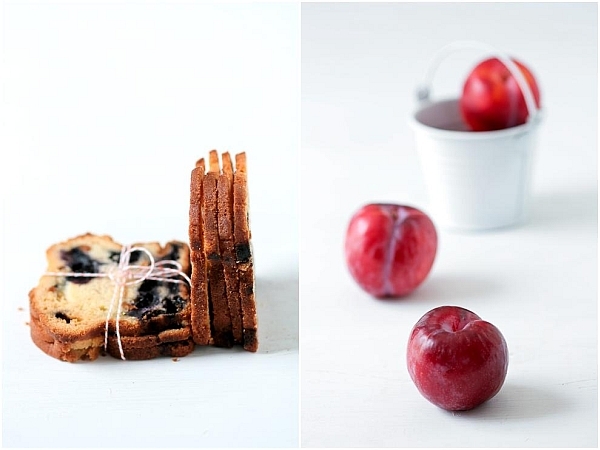 I love the photo of the sliced and blueberry toast! fantastic idea, in slicing them so thin! Great recipe and wonderful shots!! you are *truly* an artist of food. the colors, flavors and combinations you evoke are just amazing! 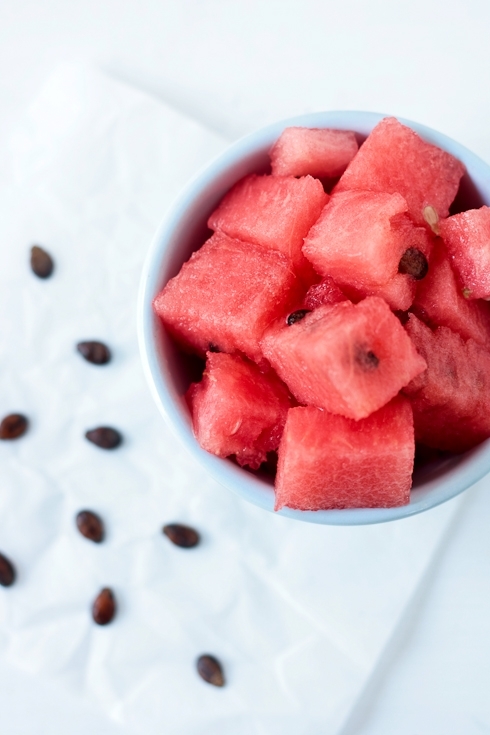 Plum and watermelon, that's an original combination! As usual, your creation is stunning and so tempting! Dis, le monsieur avec le verre de vin ce ne serait pas ton Papa par hasard? Merci Papa d'Helene pour le beau portfolio! And really interesting combination, I would not have thought of pairing watermelon with plums at all. It looks lovely and summery. And thanks for the tip on the portfolio site! I've been looking to find a good one too, so this might be something worth looking into! oh my goodness! this must be heaven! glorious recipe! p.s. : I'm giving away a gold leaf necklace. don't miss it! Ohh look at those little plums! I think I'll have to make this. The store downstairs stocks so many fruits and it's so very hot out! Ah, i always find it hard to find room for dessert after a dinner (can't plan ahead.) But, these are so lovely I would make room. What a beautiful new look...simple and chic. You have been an inspiration to me in so many ways (I was inspired to go to pastry school and start my own blog because of you). Thanks for your passion and the beauty you bring to others. oh so perfect for the scorching summers we endure in the south! you read my mind with this one! Okay, this combination is the best dessert in the world! Wow what a meal! Everything looks fantastic!!! Great inspiration as I head to Vermont - I am hoping the blueberry farm down the road is still harvesting - the cake looks amazing. I love the idea of different herbs for the ice cream - thank you! i've been out of town and this is the first chance to see the new page! lovely! I write this recipe. Thank you ! I so cannot believe I just found you. Your blog posts literally make me want to take a running dive directly into my computer. I am going to be back here. Often. Often. the Lemon balm ice cream sounds very refreshing. love your photos! Have been silently following your blog for a while and I think it's about time I tell you that it's AWESOME. Your photography and recipes are all wonderful. Look forward to more. I have to say that I LOVE the new design of your blog. Very needed also here in Bologna, Italy, where we use the same ingredients of South Carolina: scorching heat and crazy humidity, well mixed together. Oh, what a great idea! I've been living on gazpacho this week, but a cold dessert soup is brilliant! Mmmm! That rhubard-watermelon soup with basil ice cream is one of those happy food memoments that will stay with me for a long time. Thanks for bringing it back to life on your blog. Now, I wish summer would hang on just a little longer. I am in Knoxville right now visiting my brother and his wife. I am definitely wilting. I think you are right. I think people raised here are naturally acclimated. Meanwhile, there is some watermelon here in the fridge.... hmmm. I have never tried sweet soups, Helen, but I know I'd love this - watermelon is such a favorite of mine! 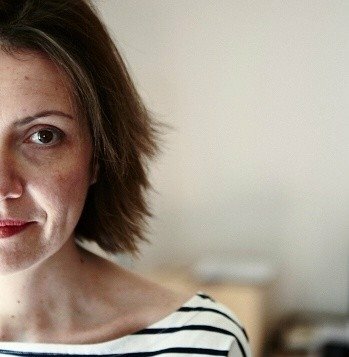 Hi Helen, I love the new design of your blog and your images are delicious (as usual)! I love the way your new blog looks! gorgeous photography and wonderful styling... especially the pound cake shot. Wow, the thin slices of cake is SUCH a smart idea with this fruit soup! 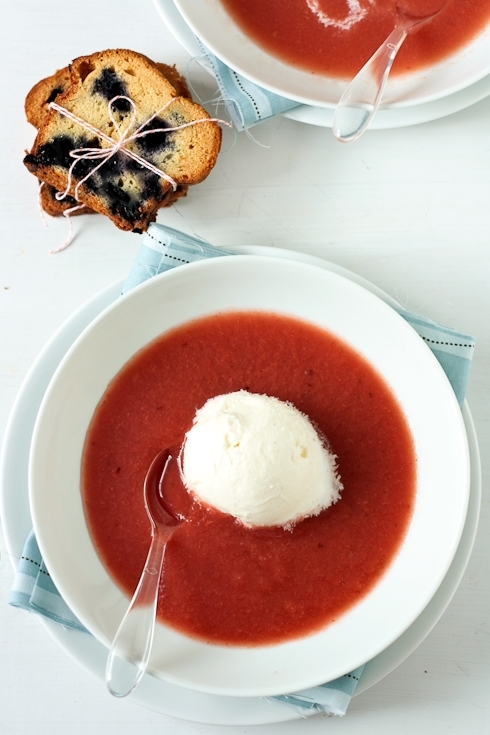 I made a strawberry watermelon balsamic soup last month (first time doing a cold dessert soup) and something like the cake sounds like a fantastic addition. Also, your portfolio is gorgeous! I am jealous, of the design and the photography skills. One last note - I grew up in NC and I still cannot deal with the heat. Do not feel bad - if there is such a gene, it's not in all of us Southerners.